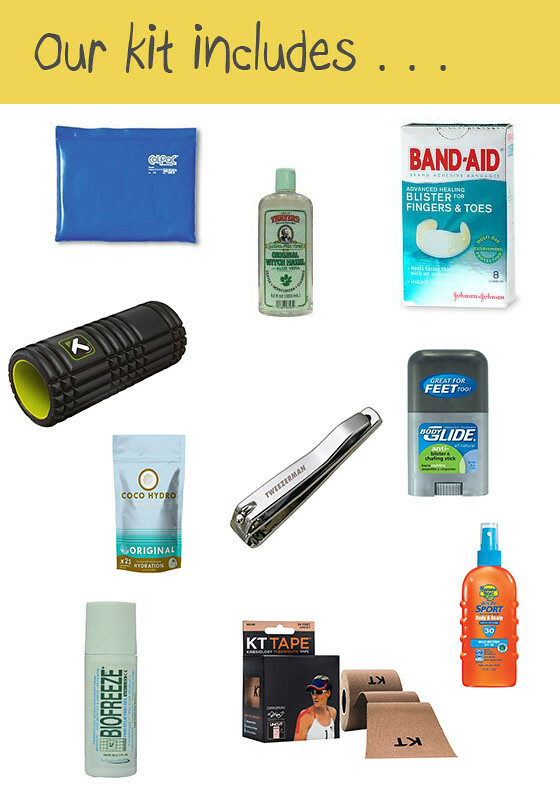 I don't think I've seen many posts about the random things runners need from time to time to heal up blisters, sore knees, cuts, and the like. 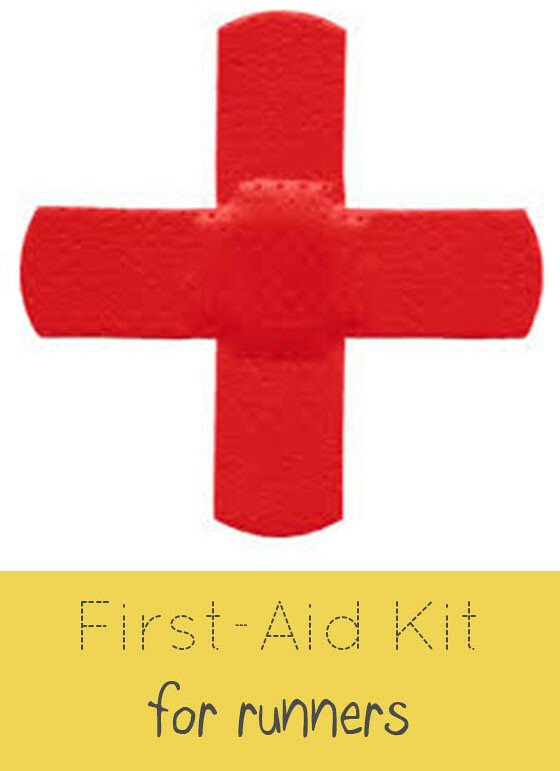 And, really, we didn't assemble any sort of first aid kit on purpose. Instead, there's been a gradual accumulation over the years as we've encountered various issues on the run. // Biofreeze Roll-On. It's always best if you have a nagging ache or pain to address the issue before medicating the pain away. However, if you're actively resting or the pesky IT-band is acting up again, rolling on some Biofreeze can provide temporary relief. And the cryotherapy benefits will last up to 6 hours. // Bodyglide: File this one under preventative. I get major chafing under my armpits and between my thighs, especially on long runs. Using a bit of lubricant gel can help keep everything gliding smoothly and avoid that nasty sting when you finally have to go into the shower + the water hits the sore spots. Ick. Not fun at all. // Sunscreen: Another before-the-issues-happen sort of item -- SUNSCREEN. I think a lot of us are bad at sun protection in the summer months. And year-round, if we're being honest with ourselves. I get particularly bad burns on the top of my head, which is why I like Banana Boat's SPF spray specifically formulated for use on the scalp. // Cold Pack: When frozen peas just won't cut it (we eat them too fast! ), we use our trusty cold pack to ease discomfort and keep overuse injuries (again -- that stupid IT-band!) at bay. Ours is designed for clinical use and provides 30 minutes of soothing relief. // Foam Roller: So, I guess we like to think outside (what would fit in) the box. If you can't tell, a lot of my running issues are from IT flareups, so I use a foam roller + regular yoga practice to keep things loose and happy. // Toenail Clippers: Of course we know clipping nails is all part of regular hygiene. For runners, keeping toenails clipped short + evenly (no sharp pokers!) is especially important. I've definitely found myself searching around the house in emergency-mode before a long run looking for clippers. // KT-Tape: While I do stay away from Ace bandages, knee braces, and other over-the-counter injury aids, KT-tape can be a great help for little nagging things. It's just a bit of support where you need it + provides 140% bilinear elasticity -- the same as human skin. // Instant Coconut Water: I suppose this is more of a luxury item, but we have some powdered coconut water on hand for particularly hot days when water, alone, isn't cutting it for hydration. More potassium and less sodium than most sport and energy drinks. Less spoilage and you can water down the flavor more to your liking, too! What essentials did we miss?